Monster truck hill stunt 3D, the most thrilling and exciting freestyle game with most of realistic features. Monster truck hill stunt 3D is the best monster truck driving and racing game for kids. Do you think it&rsquo;s easy to maintain the balance while driving a monster truck? So here comes the best monster truck racing game to check your skills .The game is full of adventure and different features like garage the best monster truck game for kids. Do you love monster truck driving and racing games? So here is the game you can enjoy endlessly by collecting as many coins and rewards as you can and use them to upgrade your monster truck. The game contains different turbo boost by gaining them you can speed up your monster truck and don&rsquo;t forget to collect the fuel gallons if you will not collect the fuel gallons then you cannot make high score .make as many high score as you can and share them on google play with different people it&rsquo;s not as much easy as you think. 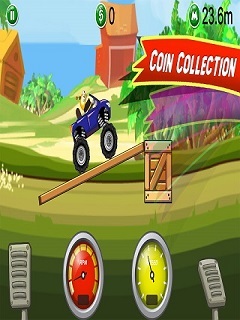 Maintain the speed of your monster truck so that you can maintain the balance if you will not maintain the balance then you will lose by crashing your monster truck .monster truck hill stunt is the best hill climbing game for kids as they can enjoy different environments the game is full of adventure with different surrounding .this game takes your endless racing genre to whole new level of racing. Monster truck hill stunt is the best monster truck stunt game it provides you the best graphics smooth controls. it is the best endless racing game that includes many stunts and high speed racing with many rewards it includes nitro boost .you must have played many monster truck games but playing monster truck hill stunt 3d will make you forget all the monster truck games that you have played due to its immense cool game play if you are fed up of playing different endless subway and heavy bikes game then monster truck hill stunt 3d is the game that you will love to play and has been published for endless genre game lovers monster truck hill stunt 3d includes many rewards and bonus points that you have to collect while driving in zigzag uphill and downhill tracks drive your car patiently cause once you tap the acceleration button then the monster truck speeds up very fast and becomes out of control but while controlling your monster truck patiently don&rsquo;t forget to collect the fuel gallons cause the fuel gallons are the most important thing for you. If you will not collect the fuel gallon then you cannot make high score and your monster truck will end up standing at one place .monster truck hill stunt is the best game for kids who want to enjoy endless hill stunt games. We bring you a stunning off road monster truck hill stunt racing game with realistic 3D environment full of fun and adventure. Become an aspiring uphill monster truck driver or racer by driving super cool cars, monster trucks on vast mountains and different environment. It takes you to the endless racing genre to a whole new level. Be a furious and crazy monster truck driver or racer on different hills so that you can perform illegal stunt actions without the police chasing you. Get ready to drive all kinds of big jeep vehicles and monster truck through the off road hills Go easy on attractive OFFROAD and sharp turns, you don't want to be falling down the cliff as you take your monster truck on the bumpy &amp; rugged terrain in the absolute stunning environment . Some cars will also come in the way your monster truck, but don&rsquo;t hesitate to jump over those small cars because you will get bonus points on jumping over them.